“In early 1993, an anonymous young woman was driving between Mexico City and Poza Rica, Veracruz, as part of her regular route as cosmetics saleswoman. Upon reaching the Teotihuacán archaeological site, she became aware of an object she thought to be a UFO in the clear blue skies. “The next thing she new, she had arrived at her destination. Perplexed and afraid, she glanced repeatedly at her wristwatch and noticed that it indicated the very same time at which she'd left Mexico City and was driving along the expressway that runs past the Teotihuacán pyramids. Her pulse racing, she pulled into an alleyway in Poza Rica to steady herself. A passerby informed her that the time was now 2:00 pm -- three hours later than the time on her wristwatch. The mechanics of how she had been able to traverse the 300-kilometer distance without being aware of it eluded her completely. “She conducted her business transactions nervously, haunted by the experience she had undergone. In the weeks that followed her "missing time" experience, the cosmetics saleswoman began to experience lassitude and nausea to the extent that she went to see a doctor. The physician dutifully informed her that she was pregnant -- a statement that astonished her, since she was still a virgin and did not even have a boyfriend. “Seven months later, at a private clinic whose name and location [was kept confidential by the researcher], she gave birth to a strange creature having double-membraned eyes, thick frog-like lips, joined fingers and hard, shell-like features on its skin which were similar to a tortoise's shell. Panic spread among the delivery room doctors and nurses, and only stern admonitions from the clinic's director kept the story from circulating any further. 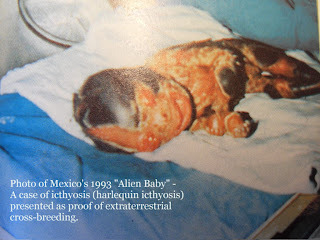 “The bizarre newborn remained inside an incubator for three weeks after its birth in September 1993. A physician's report indicated that the "baby" would not drink any formula or dairy products, but appeared to crave herbs. Other peculiarities included its inability to withstand light, preferring "infrared light sources" and the development of scales along its spine. “Photos of the creature were shown to an analyst who has also requested anonymity. His expert opinion was that the newborn belonged to a "saurian or reptilian species" of some sort. The researcher's sources claim that the mother is raising her "child" alone, and that the latter is growing and developing into a full grown amphibian reptile "horrible to behold within our notions of beauty." “Is this reptilian infant merely a throwback to the very beginnings of the evolutionary trail? A human child deformed by unknown radiation or toxicity? Or can we actually believe that it is the offspring of a human mother and a clearly non-human father during a "missing time" experience? icthyosis (harlequin icthyosis, to be specific). The excitement that such stories can produce in believers in the likelihood of extraterrestrial visitors to our corner of the universe is understandable, but when evidence is presented, they are often misidentifications of very human genetic disorders. At times, photos of these cases have been used to fuel media interest in the subject or to further personal agendas. Reader beware.